FUNCTIONAL SPECIALITY: Stop wasting water due to poor connections. A Classic ergonomic structure with a single easy grip shut-off valve controls water flow. CONSTRUCTION: Withstands high pressure an hot water temperature. High quality combination of metal & plastic in an attractive design.Suits 20mm (3/4″) & 25mm (1″) taps,Outlets: 3/4″ BSP male thread. Easy-peasy quick connect. Accurate connection and water flows in right way. COMFORT: Grooved soft grip for comfortable handling. CUSTOMER SATISFACTION: 100% satisfaction guarantee and lifetime customer support service. Order with confidence! We are always available to help our customers. MANUFACTURERS SPECIAL OFFERS : “See Below for Manufacturers Special Promotions and offers”. Discover the secret to exciting new hose connectors!! Features!! 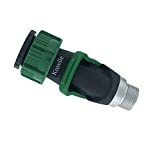 Quick & easy- Perfect for indoor and outdoor use- solution for leaky hose connections. Manifold fitted to either 3/4″ or 1″ tap. Strong durable rustproof high resistant hose connector featuring a full rubber covered body connects to the water source; One end connects to a standard water hose, other end to the source.Large valve handle makes easy and smooth on/off operation and last for years.The large diameter inlet nut is easy to grip & extra tabs which help tighten against the tap outlet to ensure no leaks.